This gang cares deeply, but often have very fixed ideas about how to support others. They believe their privileges are the result of their 'superior' values and they know best. They administer 'help' to 'victims' they believe are incapable of caring or thinking for themselves. Un-negotiated 'help' can trap and diminish others. They offer 'objective' fixes which usually suppress structures that support self-determination. Disrupt: How do you care for others? Reframe: How can we create solidarity? Caterer: I make it achievable and rewarding for all. I lower everyone’s expectations, I don't want to overwhelm them and it is unfair to highlight their inabilities. I provide basic services and comfort and it's certainly not the time or place for dissenting voices or demands for justice. Consultant: I identify their needs, advise best practice and nurture potential. I’m paid to facilitate their progress, and institute the necessary regulations. I offer my advise in a friendly manner over copious cups of tea. I may need to micromanage and supervise to help them cope with their lack of knowledge. And I lovingly subdue any hasty ambitions, it takes time to grow out of hardship. Peacekeeper: I bring culture to the void, I can work anywhere and across cultures. I bring my own team of experts to ensure it is a high quality collaboration. I provoke and stimulate them with spectacles. I demonstrate that there are endless possibilities. It will be awesome for them, and we provide an incentive for them to create their own events, when we leave. Networker: I connect, stay current and share what is hot. Yes I gossip, it’s social media, like it or not: it’s not what you say but how often and to whom. It's a powerful career to support others to network with the winners. I need to flit around, I'm constantly busy, it's the nature of the job, but I do care and no disrespect was intended. 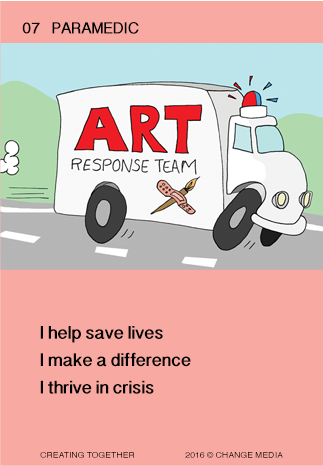 Rescuer: I save lives, I make a difference and thrive in crisis. I can’t help it, when someone is hurt I'm there. I have rescue remedies and healing knowledge. People are amazed how I don't just cope but come alive. I work best in crisis zones and leave the long-term strategies to others.